Have you ever thought your imagination can do wonders for your health? Science has proven that painting each day reduces stress, aids memory, helps people break free from their personal limitations and improves co-ordination. The Journal of American Art Therapy Assoc published a survey showing that cortisol levels after 45 minutes of painting had reduced significantly and as we know cortisol creates stress and stress creates ill-health and affects us emotionally. I agree wholeheartedly with this – “when one is painting, all else is forgotten momentarily, including any worries and concerns. One’s attention is totally in the moment.” Painting is a great way to elevate one’s mood in the dark grey Winter months…. 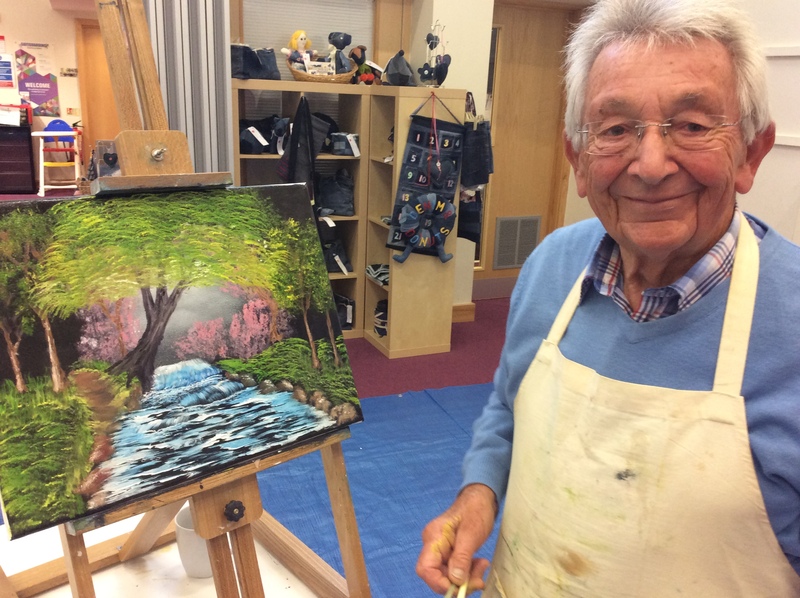 your own personal Vitamin D.
One of my art students, Peter Ratcliffe, has done just that the last few years who says “I was diagnosed with prostate cancer in 2017 and undertook radiotherapy and hormone therapy over a 12 month period. During this time, the painting workshops and personal support from Sophia were amazingly helpful and the good news is the treatment was successful. I continue with my painting to this day which I find very enjoyable”.